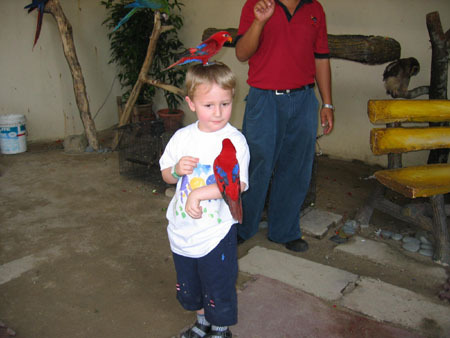 On January 31, we went to the Kuala Lumpur Bird Park together with a colleague and his family. We walked around for some time, saw a peacock spreading its wings and Yde had the opportunity to hold a few birds. After watching the bird show we decided to go to the Hornbill restaurant for lunch. Later that day we met the other colleagues for a drink and together we went to Suzie's Corner for diner. 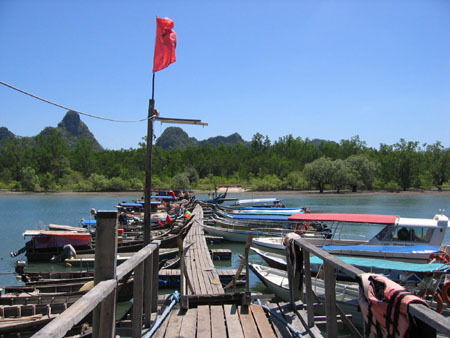 On Februari 1, we took an Air Asia plane to Langkawi Island and arrived there shortly after 5 pm. We decided to rent a car at the airport and around 6 pm we arrived at the Sheraton Beach & Spa Resort. After moving into our room, which was big enough for the four of us, we had a nice bufet diner at the restaurant. 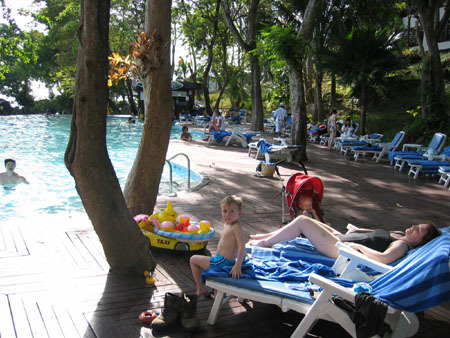 Going out in mornings and returning for Vibeke's nap in the afternoon, we also spent some time at the pool. In the afternoon a small part of the swimmingpool was covered with shade, an excellent condition for Yde who wanted to learn swimming. Of course we relaxed on the sunbeds after swimming enjoying a drink from the pool bar. 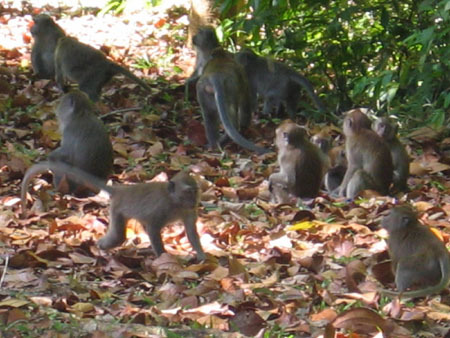 The hotel hosts not only human guests, also two species of monkey's are living on the property. 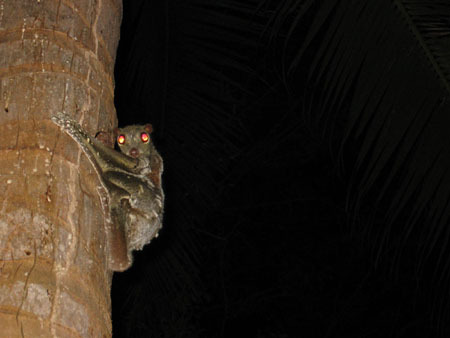 In the morning you could see them near the lobby climbing trees. Another animal, I forgot its name, came usualy alive after dark. When sitting on our terrace we saw many of them flying around and climbing the trees. Most of the evenings we went out for diner. 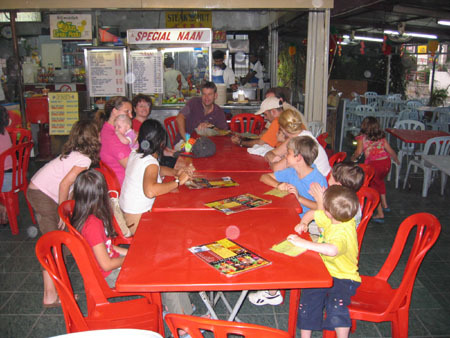 This picture is taken at the Lighthouse restaurant which is located between Pantai Tengah and Pantai Cenang. We were just in time for a beautiful sunset. In the middle of our stay at the Sheraton we had a problem with some bees. 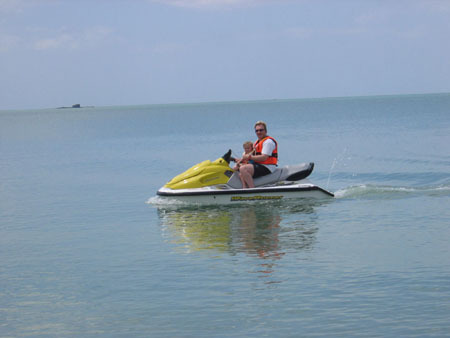 Jitze was already at the business center to check his email and I would follow with the children 20 minutes later. When I wanted to leave our room a friendly staff member told me to stay inside because a beehive had fallen down in front of our entrance. When he was talking to me a bee attacked him so I quickly closed the door and stayed inside. Jitze, in the meantime, was waiting for us at the lobby and after 30 minutes he decided to check where we were. When he arrived I just had a call from the hotel staff that it was safe enough to leave the room. So we left all together for a short afternoon trip. Returning at the hotel we noticed that the road to our room was blocked, so we went to the lobby and asked at the frontdesk why we could not go back to our room. BEE'S again and if we could wait a second for the manager. The manager told us about the bee problem and transfered us to another room. After diner we packed our belongings and moved to another room. The minute we opened the door of our new room we saw that we were very lucky with this transfer. 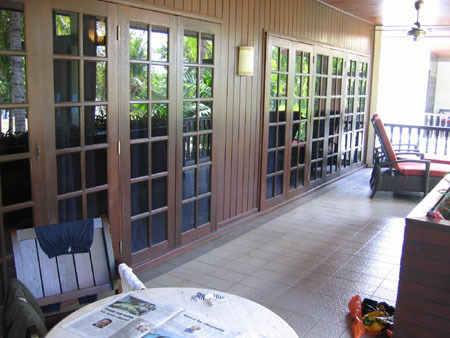 It was a so called "executive room" with a living room (as big as our former room) and a bedroom. 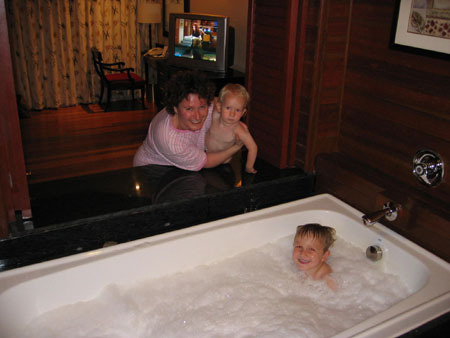 Two tv's, two toilets and a very big bathroom with jacuzzi. The man who helped us with our luggage asked Yde if he knew how to operate the jacuzzi and Yde said:"no!". The man told Yde that he had to put a whole bottle of the green bathfoam into the tub and then fill it with water to a certain level. Push the button on the side and have fun. 15 Minutes later Yde did what the man had told him (except for the whole bottle of foam, we took half) and enjoyed himself. 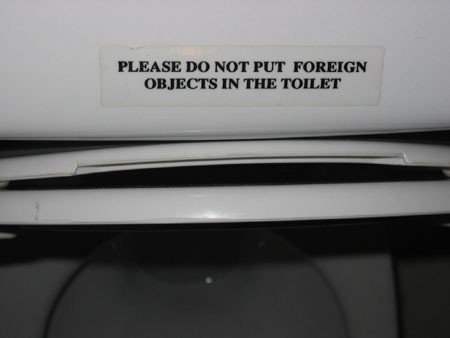 Jitze is still wondering what foreign objects are and why you are asked not to put them in the toilet. With a "huge" room comes a "huge" terrace. 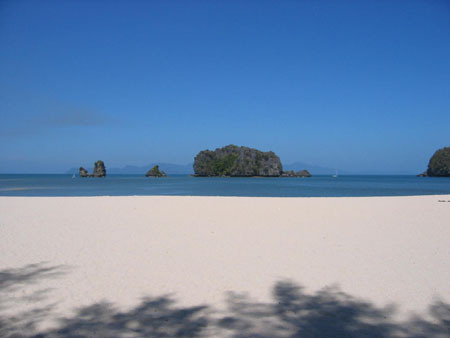 On one of our trips we went to Casuarina Beach located in the north-eastern part of Langkawi. 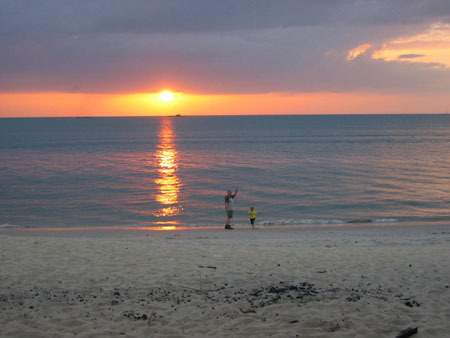 A beautiful white sand beach with magnificient views. Before we booked the Sheraton we wanted to stay at the Tanjung Rhu Resort but due to Lunar New Year it was fully booked and now we know why. The resort gives acces to this beach and who does not want to relax here. The local harbour in the north-east. 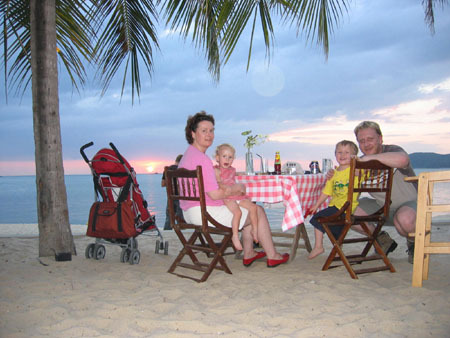 On February 11 we returned home but we are sure that we will visit Langkawi again.